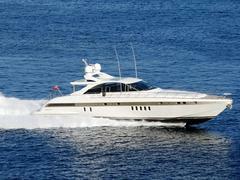 The Mangusta 80 Open superyacht, Peleu K, is the latest central agent listing for Jurgen Koch at Fraser Yachts in Majorca. Built by Overmarine and launched in 2006, the superyacht’s twin 2,181hp MTUs deliver a top speed of 46 knots and comfortable cruising at 38 knots. “Peleu K is here in Palma,” confirms Arancha Garcia this afternoon. Peleu K has accommodation for six guests and two crew and an asking price of €3.2 million.